Tell someone, "I love you!" 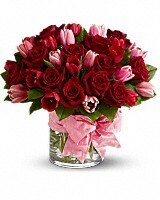 with two of nature's most beautiful blooms - fragrant crimson roses for romance, and delicate pink tulips to signify friendship and devotion. Accented with a big pink bow, this magnificent floral gift will create a sensation.